What are various options for creating pneumoperitoneum? What is the problem with using Air for insufflation? The problem with using air insufflation is that nitrogen of air is poorly soluble in blood and is slowly absorbed across the peritoneal surfaces. Air pneumoperitoneum was believed to be more painful than nitrous oxide (N2O) pneumoperitoneum. However air is less painful than carbon dioxide (CO2) pneumoperitoneum. What are the advantages of using N2O as an insufflating agent? N2O has the advantage of being physiologically inert and rapidly absorbed. It also provided better analgesia for laparoscopy performed under local anesthesia when compared with CO2 or air. Despite initial concerns that would not suppress combustion, controlled clinical trials have established its safety within the peritoneal cavity. N2O has been shown to reduce the intraoperative end-tidal CO2 and minute ventilation required to maintain homeostasis when compared to CO2 pneumoperitoneum. What are issues with using inert gases for insuffluation? 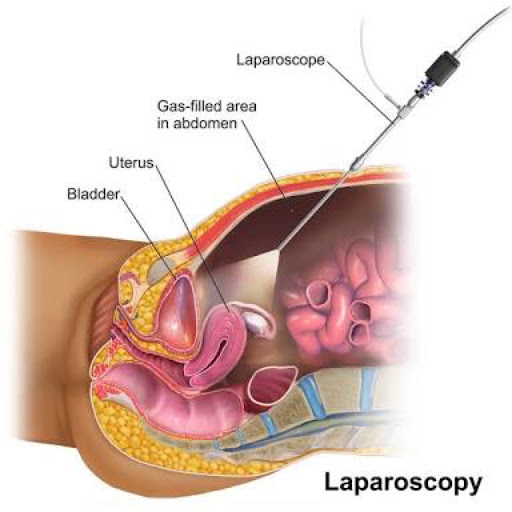 Alternative gases that have been suggested for laparoscopy include the inert gases helium, neon, and argon. What are various local and systemic effects of Carbon dioxide gas insufflated into the peritoneal cavity ? 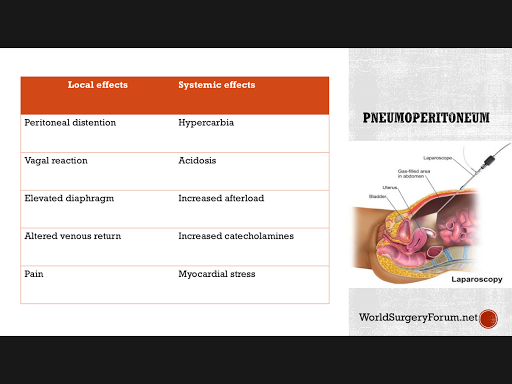 What is most common arrhythmia caused due to pneumoperitoneum? The most common arrhythmia created by laparoscopy is bradycardia. A rapid stretch of the peritoneal membrane often causes a vagovagal response with bradycardia and, occasionally, hypotension. "Serum cortisol levels after laparoscopic operations are often higher than after the equivalent operation performed through an open incision." Is the statement True/ False? What is the maximal pressure range for pneumoperitoneum?